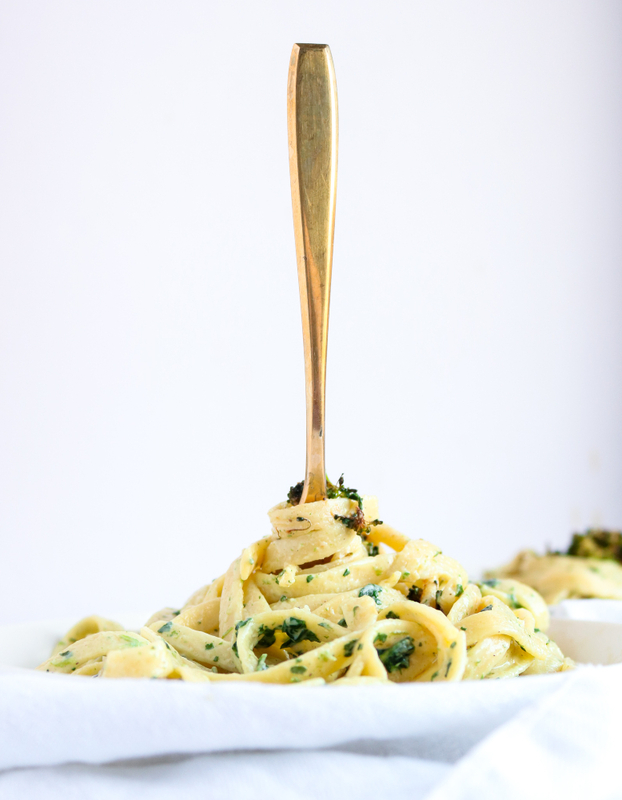 Creamy Vegan Broccoli Pasta - a quick + easy dinner to impress! 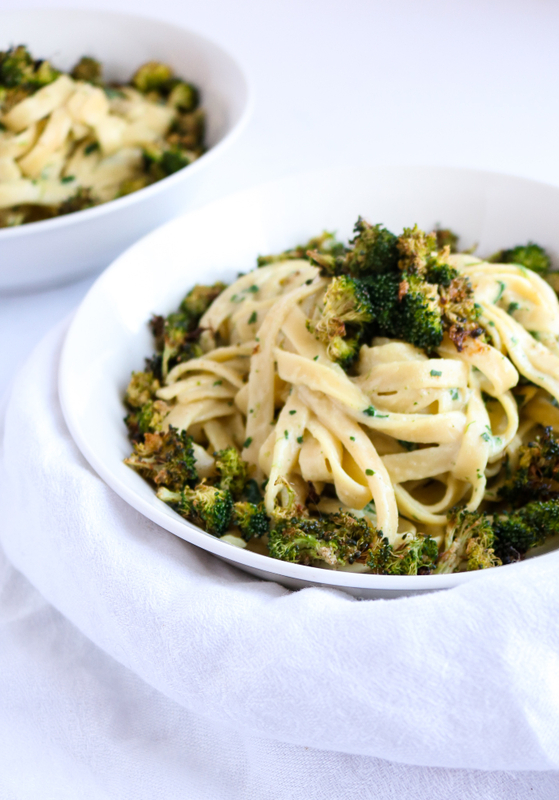 Get ready to have your socks knocked right off your feet with this easy creamy vegan broccoli pasta – made from silken tofu, NOT cashews! It’s the perfect recipe for a quick weeknight dinner for the family and also makes for a seriously impressive date night in. How many people do you know who are afraid to go vegan because they “could never live without dairy”? I’m betting you know at least one if not several dozen. And hey, maybe you’re not yet vegan and dairy is what’s holding you back from making the leap. In any case, I hear you. I was that person who was afraid to let go of dairy. I was afraid I would never again taste the decadent comfort from a big bowl of mac and cheese after a long day or a rich creamy alfredo sauce so amazing, you can’t help but eat it with a spoon! Then, I met a new friend – silken tofu. 😍😱 And suddenly, my vegan life was FILLED with creamy comforting pasta dishes once again. Not to mention – creamy salad dressings, a spicy queso sauce, and even these homemade vegan mozzarella balls! They were all within reach once more. Silken tofu rocked my vegan world, and it can do the same for yours. The dish I present to you today is a super easy creamy vegan broccoli pasta dish using this magical ingredient. Feel free to play around with the spices, however! Silken tofu takes on the flavor of whatever you add to it, so there’s LOTS of room to get creative…which we will always encourage in this house. 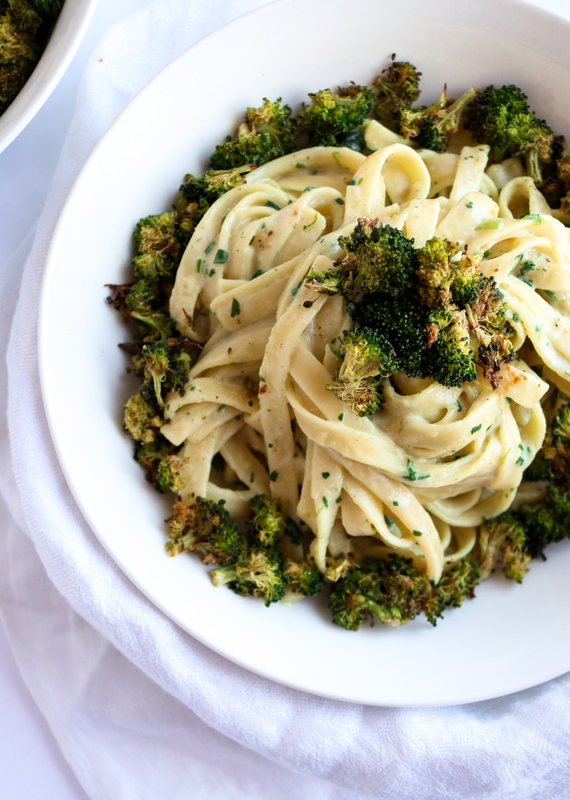 If you try this creamy vegan broccoli pasta, let us know! You can rate the recipe and leave a comment below or tag us in your splenderific photos on Instagram. We’re @theplantpowercouple with the “the”. 😉 It’s so much fun when you do that! We are rather confident you’ll fall head over heels for it as easily as we did. Cheers! This easy, vegan pasta dish is so creamy and comforting. You'll LOVE serving this as an easy, quick weeknight dinner. Cook your pasta according to the directions on the package. Set aside. Next, the broccoli: Preheat your oven to 400F and line a baking sheet with parchment paper. In a large bowl, toss the broccoli florets with the oil and spices. Roast at 400F for 13-15 minutes. Whilst the broccoli is roasting, throw all sauce ingredients - excluding non-dairy milk and tapioca starch - into a small blender. Blend until smooth. Add contents of the blender to a medium sauce pan. Turn heat to medium high. In a small bowl or glass, mix the milk and your tapioca starch with a fork. Immediately pour this into the sauce pan and whisk the entire mixture until no clumps remain. Allow the sauce to thicken, whisking often. We let ours cook for about 5 minutes. If it gets too thick, add more liquid. Not thick enough? Add more tapioca starch (1 tsp at a time, whisking and waiting in between each addition). Remove sauce from heat and stir in chopped spinach and pasta. If your pasta has been sitting for a while, you may want to splash it with some hot water before adding it to the sauce. Stir in half of the broccoli and add the other half as garnish on the top of the pasta dish. Adjust seasonings as necessary and enjoy! Try tofu pasta too for less calories. Made by House of Foods! Just rinse and fry in a pan no spray or oil till all water is removed! What could I sub the tofu with.... I can't have soy! Thanks this looks delicious and I would love to make it without the tofu if possible!